The first picture of today’s post caught the moment I held my Eat In My Kitchen cookbook in my trembling hands for the first time. I had to sit down, or rather, I fell into my beloved old chair in our living room. This chair has seen many emotions, sad and happy, it’s been with me all my life and it’s the place I want to be when the world around me becomes a little overwhelming. So a couple months ago, on a hot day in July just a day before we flew to Malta, this chair had to catch me once again. My knees were wobbly and I didn’t know if I should laugh or cry, so I did both. I received a package from my publisher and I knew what it was before I even opened it: two books, my books. 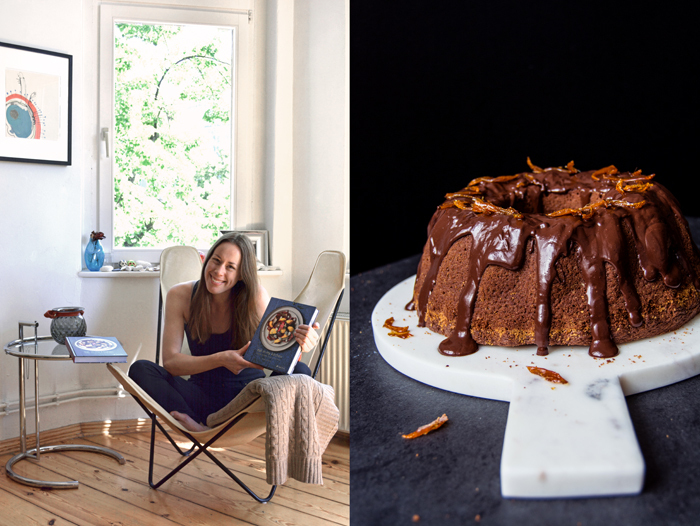 Tomorrow is a very special day, my German book, Eat In My Kitchen – essen, backen, kochen und genießen, will be published and in a week the English book will follow: Eat In My Kitchen – to cook, to bake, to eat, and to treat, on October 4th. The book is already on Epicurious’ list of ‘The 25 Most Exciting New Cookbooks for Fall 2016’ and my heart is jumping for joy!! So many people keep asking me how I feel about my big publishing day(s), whether I’m excited, proud, or nervous. To be honest, I can’t really say how I feel. Maybe confused and overwhelmed? As much as it felt normal to write this book at one point, to cook and bake the recipes, and to take the pictures, strangely enough it’s starting to feel normal to know that it’ll be out soon. It may sound weird and maybe I’m wrong, maybe I’ll have a nervous breakdown at one point, maybe when I present the book in front of an audience (in the next few weeks, all over Europe and in the US), or when I see it at a book shop, or when I watch people pulling it off a shelf and buying it. I don’t know. Luckily, I don’t have much time to think about all this, which is sometimes the best thing that can happen. 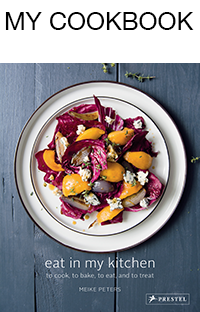 Eat In my Kitchen feels as intuitive, natural, and close to myself as it can get. The physical book just as much as this blog. I’m in my comfort zone, constantly, which I consider to be the greatest gift. I don’t take anything for granted in life, I’m here and I want to learn, grow, and experience everything. I don’t know if I’ll fail or succeed with this book, but it’s also nothing I want to worry about. Every recipe, every story and picture that fill the 256 pages of this book is totally me, to question or doubt its relevance, would be fatal. That would mean questioning my passion and my beliefs, before this book even sees a shelf in a bookstore. I can say that I’m unbelievably happy that this book exists. With a big smile on my face, I stand behind all I’ve created and written in the past year and a half to fill its pages, in both the German and the English book. I went through many lows and I took the highs with great pleasure, I suffered and I cried, I changed some decisions and stood strongly behind others. I’ve been through my battles, while working on these pages. But now I let go. A month ago I wrote about this transition, this process of letting go of a project. Tomorrow, this process will be complete. Today sees a premier on the blog, I’m sharing the first recipe from my book with you and, also for the first time, I’ll share a recipe in English and in German. I get many requests to write my blog in two languages, and as much as I’d love to do that, I simple don’t have enough time. I appreciate the effort of so many of you who aren’t that familiar with the English language but still give it a try and follow my recipe instructions in a foreign language. 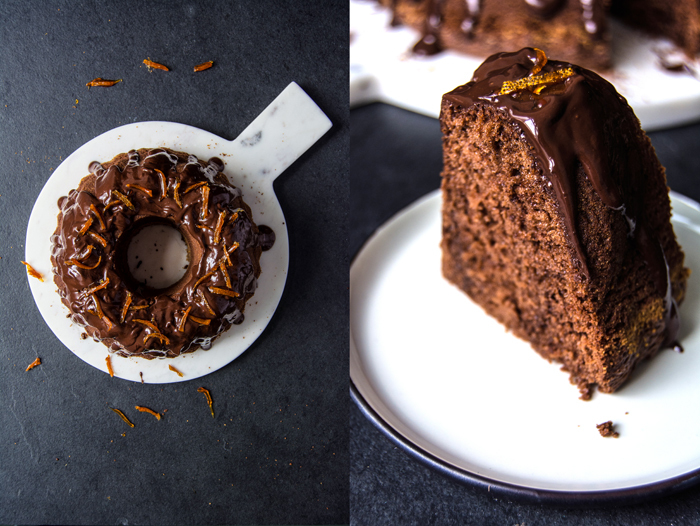 Today, my German readers, you can relax and bake the most delicious, spongy chocolate olive oil Bundt cake, topped with a thick chocolate glaze and sweet and crunchy caramelized orange peel. I love this cake! Next week, I’ll share another recipe from my book with you, on the 4th October, on the day when my English readers can hold the book in their hands for the first time. I’ll be in Malta at that point, celebrating the book at my launch at the gorgeous Villa Bologna before my journey takes me to London, New York, and Washington. I’ll try my best to keep up with writing about all this here on the blog – and I also intend to start sharing videos on Instagram, so please come over and join my journey in the next few weeks and months. 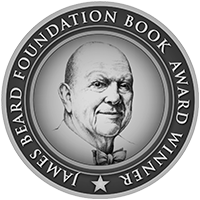 Today I want to thank my amazing team here in Germany, all the wonderful women and men who made this book possible. Thank you everyone at Prestel in Munich, especially Pia, Julie, and Adeline. Thank you so much Ellen Mey for being my editorial guidance. Preheat the oven to 350°F / 180°C (preferably convection setting). 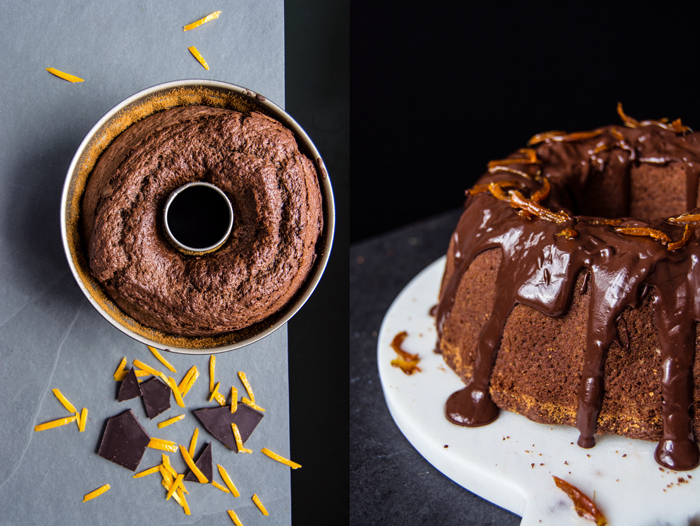 Butter a 7½-cup (1.75 l) Bundt pan and sprinkle generously with breadcrumbs. 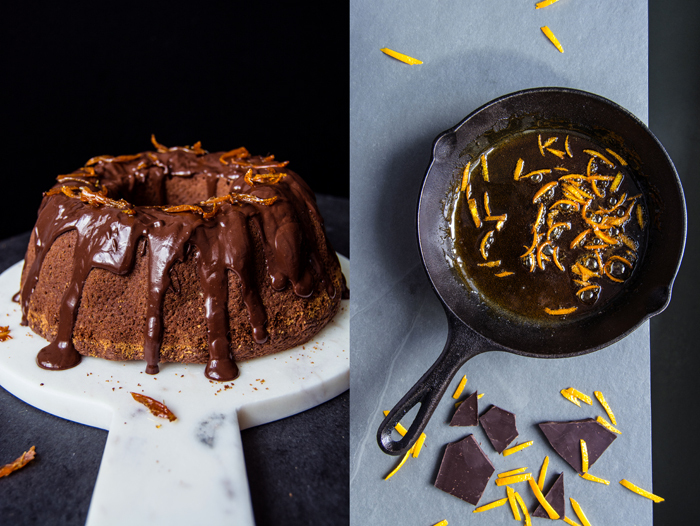 In a large heat-proof bowl set over a saucepan of barely simmering water, melt the choc­olate. Let cool for a few minutes then add the olive oil, eggs, milk, orange zest, and orange juice, and beat with an electric mixer for 2 minutes or until smooth. Add to the flour mixture and quickly mix with an electric mixer for 1 minute or until well combined. 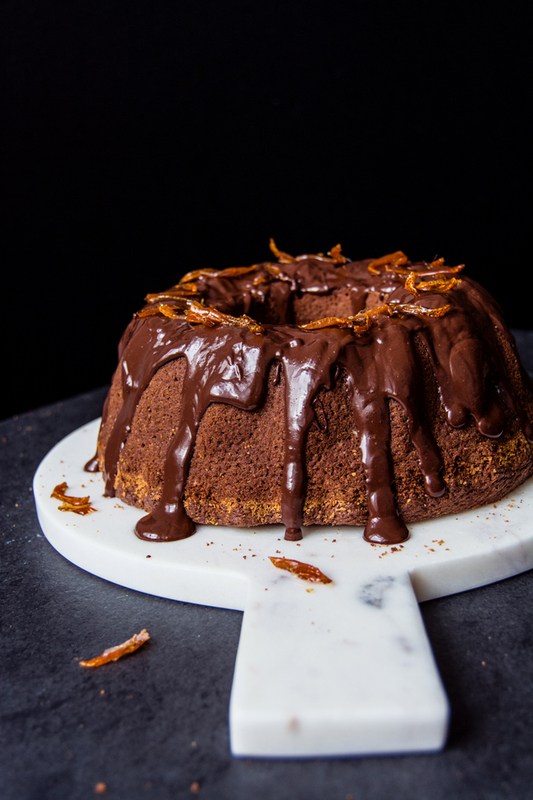 Pour the batter into the prepared Bundt pan and bake for about 35 to 40 minutes (slightly longer if using a conventional oven) or until golden brown and firm on top. If you insert a skewer into the cake, it should come out clean. 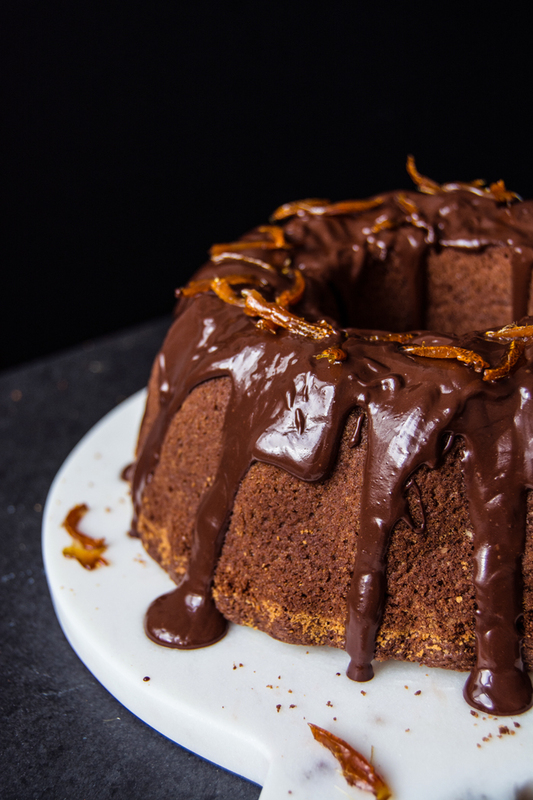 Let cool for a few minutes then shake the Bundt pan a little and turn the cake out onto a plate. Let cool completely. Trim the bottom of the cake to even it out. 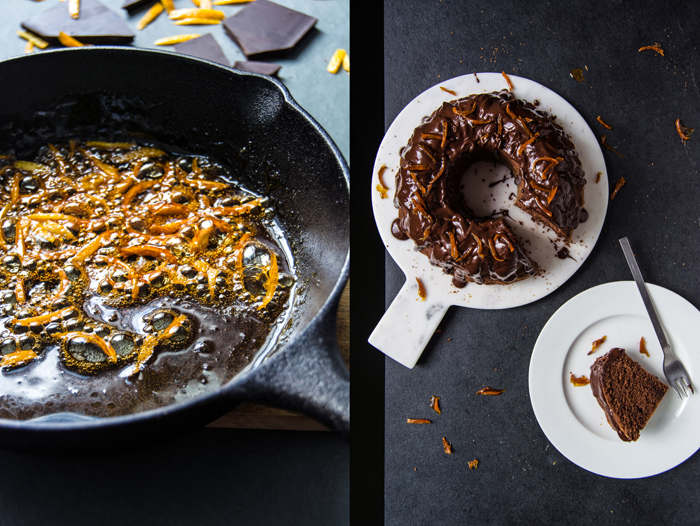 For the chocolate glaze, melt the chocolate and butter in a saucepan over low heat. Add 1 to 2 teaspoons of vegetable oil and whisk until smooth. 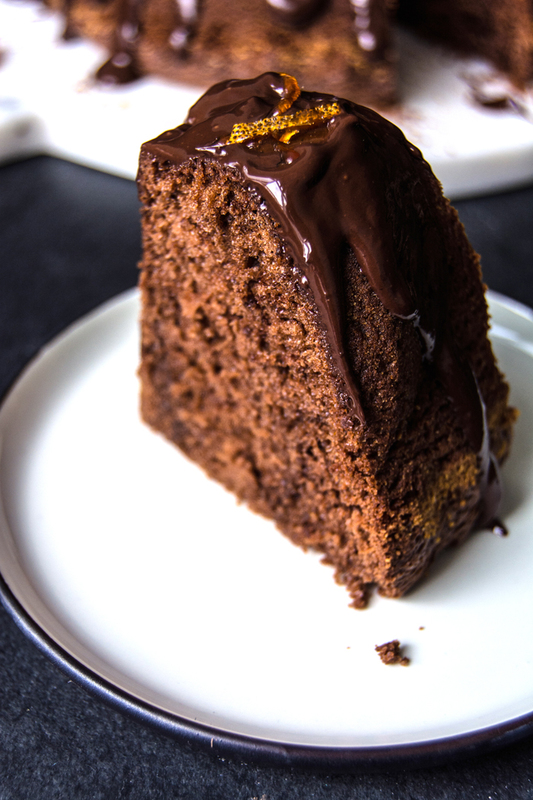 Pour the glaze over the cooled cake, evening it out with a knife or leaving it in voluptuous drops. For the candied orange peel, in a small saucepan, bring the sugar and water to a boil. When it starts to caramelize add the orange peel. Reduce the heat to medium and cook for 3 to 4 minutes or until the peel is golden and soft—mind that it doesn’t burn. While the caramel is still liquid, quickly transfer the candied peel to a piece of parchment paper. Let cool for 1 minute then peel it off the paper and decorate the cake while the glaze is soft. Den Ofen auf 180 °C (Umluft) vorheizen. Eine Gugelhupfform (1,8 l) einfetten und großzügig mit Semmelbröseln bestreuen. In einer großen Schüssel Mehl, Zucker, Backpulver, Speisenatron und Salz vermischen. Die Schokolade in einer großen Schüssel über einem Wasserbad schmelzen. Ein paar Minuten abkühlen lassen, dann Olivenöl, Eier, Milch, Orangenabrieb und Orangensaft dazugeben und mit einem Handrührer etwa 2 Minuten glatt rühren. Zu der Mehlmischung geben und mit dem Handrührer etwa 1 Minute gut verrühren. Den Teig in die vorbereitete Gugelhupfform gießen und etwa 35–40 Minuten goldbraun backen, die Oberfläche sollte fest sein. Ein Metallstäbchen sollte nach dem Einpieksen in den Kuchen sauber sein. Ein paar Minuten abkühlen lassen, dann die Gugelhupfform ein wenig rütteln und den Kuchen auf eine Platte stürzen. Komplett auskühlen lassen und, falls nötig, den Boden gerade schneiden. Für die Schokoladenglasur Schokolade und Butter in einem Topf bei niedriger Hitze schmelzen. 1–2 TL Sonnenblumenöl dazugeben und glatt schlagen. Die Glasur über den ausgekühlten Kuchen gießen, mit einem Messer verteilen oder in üppigen Tropfen herunterlaufen lassen. Für die kandierte Orangenschale Zucker und Wasser in einem kleinen Topf zum Kochen bringen. Wenn es anfängt zu karamellisieren, die Orangenschale dazugeben. Bei mittlerer Hitze etwa 3–4 Minuten köcheln lassen, bis die Schale golden und weich ist – aufpassen, dass sie nicht anbrennt. Während der Karamell noch flüssig ist, die Orangenschale schnell auf einem Stück Backpapier ausbreiten. Ein paar Minuten auskühlen lassen, von dem Papier abziehen und den Kuchen damit dekorieren, solange die Glasur noch weich ist.